Do You Know the Value of Your Business? Would It Be Valuable to a Potential Buyer? The reality is that most business owners have no idea what their companies are really worth. In fact, the results of a recent survey conducted by the International Business Brokers Association (IBBA) found that more than 70 percent of business owners do not know the value of their companies. And many will end up selling their businesses for much less than they want to. Whether you want to sell next year, a decade from now, or pass on the business to family or key employee, you need to build a valuable asset for the future. But how do you know your Sellability Score? The good news is that there is a proven way to dramatically improve the value of your business. It starts with the BEACON Sellability Score, an interactive tool that provides a comprehensive assessment of the value of your business. When you complete the questionnaire, you’ll get an overall Sellability Score out of 100, plus your score on the eight key Value Builder drivers, which are statistically proven to increase the value of your company. Based on the outcomes of your Sellability Score, we will help you build a strategic plan of action. Click here to learn more about Value Builder and the “sellability” of your business. 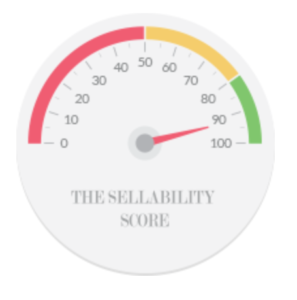 The Sellability Score algorithm was developed using a quantitative survey of more than 30,000 business owners and is continually refined, based on the thousands of business owners who get their score each quarter. Achieve a Sellability Score of 80+ and, based on research from thousands of test cases, your company will be worth 71% more than the average business. Many people mistakenly believe they must put many hours into running their businesses, year after year, to build a business someone will want to buy one day. Fact is, potential buyers are looking for businesses that can thrive without their owners. After all, once they buy your business, you’ll no longer be available to put in those 80-hour workweeks, right? The BEACON Sellability Score software will perform a detailed analysis of your business and show you the steps to take today to build a business that will thrive without you. You can start spending less time in your business right away, and enjoy the freedom you’re after sooner rather than later. At the same time, you’ll be building a valuable asset that will continue to thrive and grow well after your exit. Get your business analyzed now, and uncover the customized tweaks you can start making to unlock more freedom in your business.